Traditional, organized anti-Semitism has decreased sharply over the past 40 years, but Forster, chief attorney for the B'nai B'rith Anti-Defamation League, notes that anti-Jewish attitudes are still deep-rooted and pervasive. 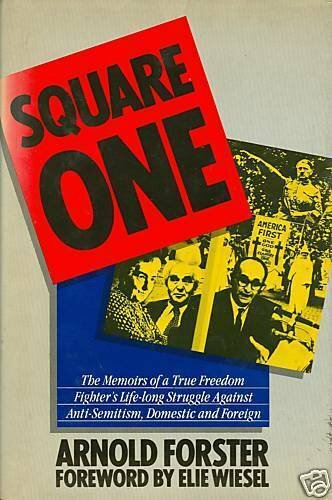 As the title of this punchy autobiographical memoir implies, society is almost "back to square one" in the fight against bigotry. One need not agree with his opinions on Jesse Jackson or Israel's handling of the Palestinian uprising to appreciate this outspoken and deeply disturbing report. Forster speaks from firsthand experience: he battled McCarthyism and blacklisting, led the fight against the Arab boycott of U.S. companies doing business with Israel, covered the Adolf Eichmann trial for Look , hobnobbed with Walter Mondale, Henry Luce, Golda Meir, Ben-Gurion. Starting with assaults on Jews made by Father Coughlin, McCarthy, the German-American Bund and the KKK, and continuing to recent incidents, Forster names names and exposes bigots in a jolting reassessment of how American Jews fare today.